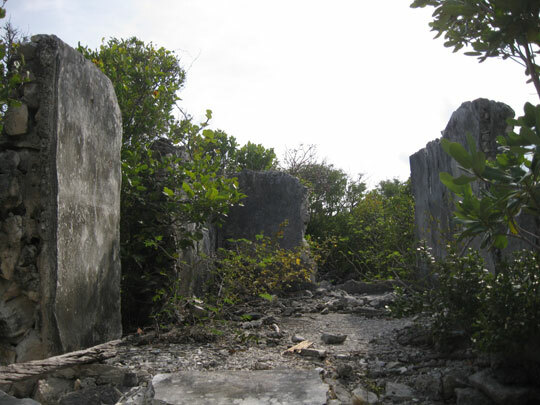 Loyalist ruins on Hawksbill Cay made of stones and conch shell mortar. A short dinghy ride north from the northern most anchorage and mooring field at Hawksbill Cay takes you around a nub of the island and to a small beach with a trail to the Russell Ruins. The Russell family were loyalists who were given a grant to settle on the Cay by The Crown in 1785. The terrain is harsh and rocky with low lying scraggly bushes and trees. 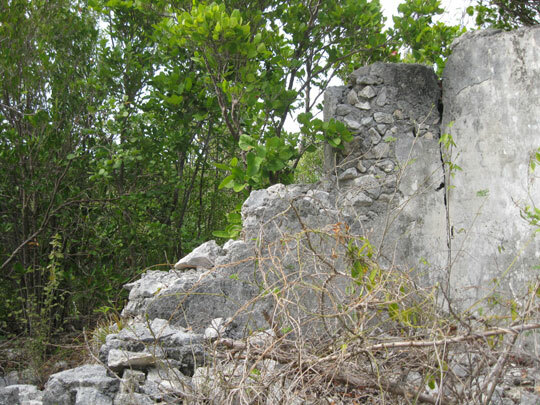 If you hike up the trail you will come to the remains of small one-room stone houses nestled in between dense vegetation. You will also find a beehive oven used for cooking and for incinerating conch shells used for making the mortar to line the walls of the homes. Strewn around the oven are piles of conch and other shells, many charred black. There are also tamarind trees and natural cisterns, now mostly dry. 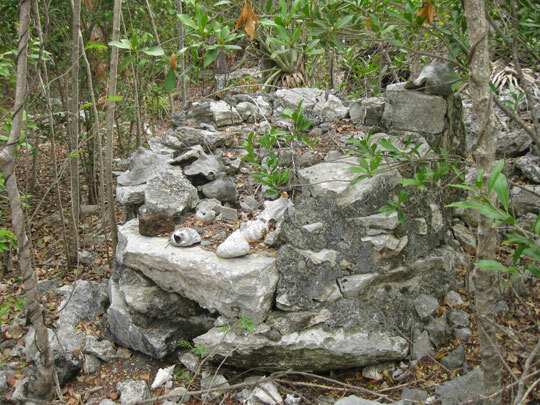 The remains of a stone oven used for cooking and incenerate conch shells. Now, I understand the idea of adventure, the want to scratch out one’s own existence, and the need to have a little bit of this earth to call one’s own. But I canâ€™t understand why anyone would want to leave the lush coast of a seemingly endless North America, teeming with new ideas and cast with a growing vibrant population to come to an isolated rock in the middle of nowhere. Were they that loyal to The Crown, persecuted by their neighbors or just obstinate to any kind of change that they didnâ€™t initiate? From the beach as you head up to the trail, before you reach the sign directing you to the Russell Ruins, there is a trail to the left. This trail most likely leads to the beach, but we didnâ€™t follow it that far. I decided to turn around shortly after we saw the snake. We did follow it far enough to encounter another crumbling building. 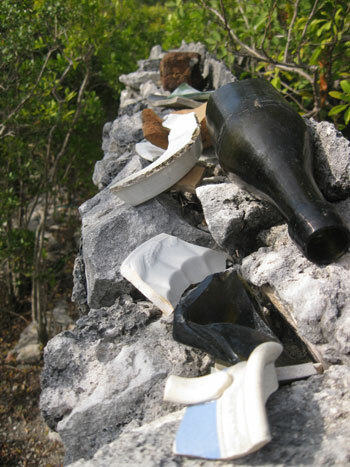 Stacked up on top of one wall of the house were artifacts, bottles and decoratively painted pieces of pottery. I imagine the women of the Russell family setting a lovely table for dinner in their one room shack with all of their finery brought from England via the Colonies, wondering if it was true love, madness or bad luck that brought them to such a place. Imagine this view out of your window every day. 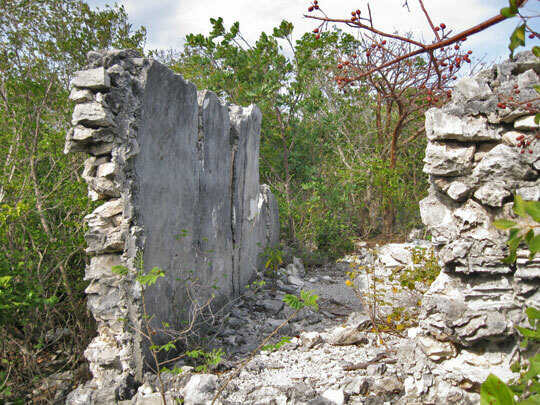 Apparently Hawksbill Cay was occupied until 1900 when the last resident, the husband of a granddaughter of the original Russell family, perished on the island. For 115 years the Russell family and descendents farmed this cay and eventually every cay within a days sail. They eked out an existence and lived a life uniquely their own, loyal to a monarchy so benevolent to bestow upon them a beautiful rock in the middle of nowhere. 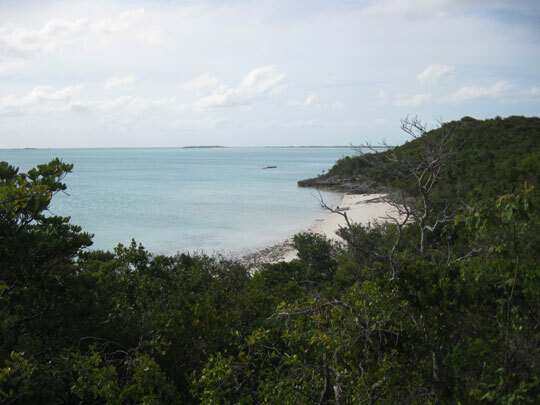 This entry was posted in Life on the Water, The Bahamas, The Exumas and tagged Exuma Cays Land & Sea Park, Hawksbill Cay, Island Hike, Loyalist Ruins, Ruins, Russell Ruins, The Bahamas, The Exumas. Bookmark the permalink. You are raising an interesting question. Obviously, there were many more people who disagreed with the revolution. There were also many people in England who disagreed with the war to quell the uprising. Ultimately, half of Quebec was filled with Loyalists who wanted nothing to do with the American experiment or rather who may have been expelled for their dissenting views from the land of liberty. Then and now, there is much to fear from revolutions, and what ultimately went well in the US went just as horribly wrong in France. Then as now, some people would choose to just live with minimal interference, if necessary on some rock somewhere. You see this in. The US again now with the renewed back-to-the-land movement. Heck, aren’t you making the choice to be captains of your little boat rather than serfs in some office cubicle?